Momentum is building for a low-carbon economy. Evidence shows that businesses, investors and governments are realizing that strong climate action is a major opportunity for better growth. 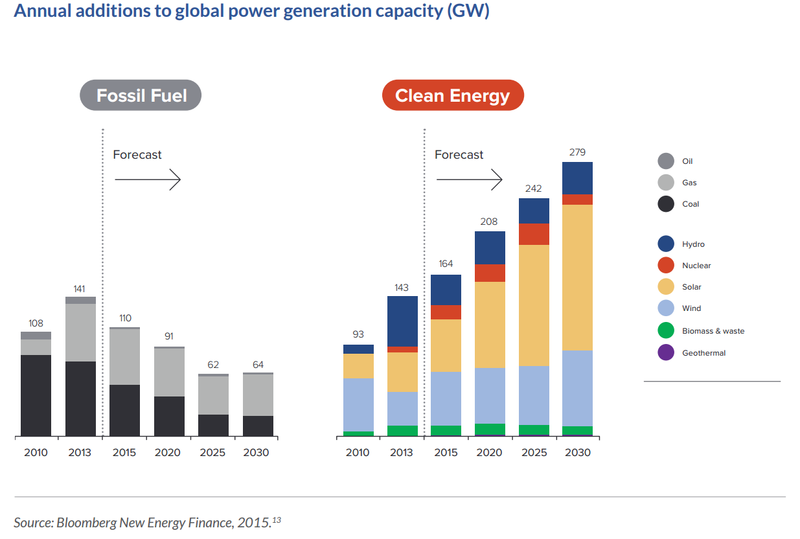 Construction of new clean power generation exceeded that of fossil fuels for the first time in 2013. The market for low-carbon and environmental goods and services is now worth more than $5.5 trillion globally, and is growing. And in 2014, for the first time in four decades, the world economy grew while emissions stayed flat. Still, we’ve got to go further. Science says that we’ll need to emit 85 percent less CO2 per dollar of GDP by 2050 than we do today in order to limit global temperature rise to 2 degrees Celsius, and prevent the worst impacts of climate change. A new report shows us how we can get there while driving economic growth. Today, the Global Commission on the Economy and Climate  launches Seizing the Global Opportunity: Partnerships for Better Growth and a Better Climate , which outlines strategies to achieve growth and climate action together. It lays out 10 recommendations that, if fully implemented, could deliver 96 percent of the emissions reductions needed by 2030 to keep global warming to safe levels. Taking action across 10 key areas can scale up the transition to a low-carbon economy, while producing significant economic benefits. 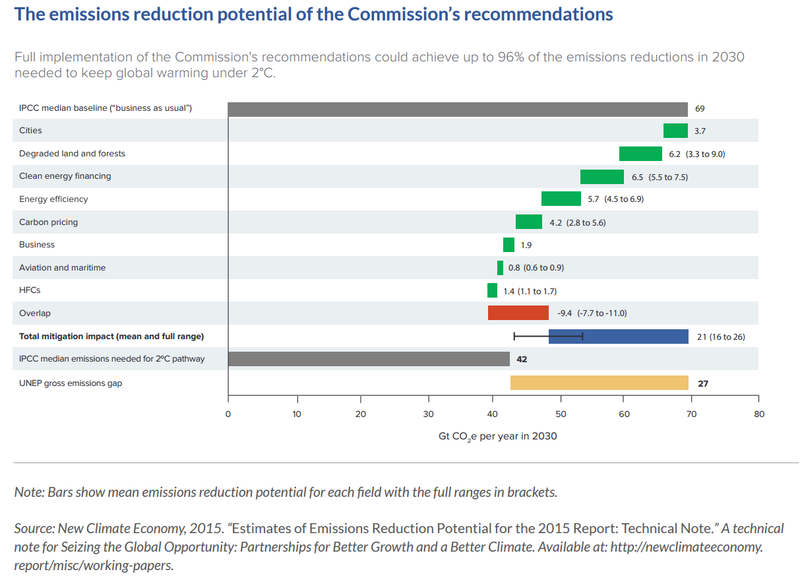 These 10 recommendations could together reduce greenhouse gas emissions by as much as 26 Gt CO2e, effectively bridging the gap between the “business-as-usual” level of emissions and what we need to keep global warming under 2°C, the internationally agreed limit. At the same time, each recommendation offers enormous economic benefits. For example, in cities, measures such as investing in mass transit and making new buildings energy-efficient could generate $17 trillion in savings by 2050. If accompanied by carbon pricing and support for low-carbon innovation, the savings that the investments would generate for cities could be as high as $22 trillion. The benefits of low-carbon development go on and on. Increasing energy efficiency standards in the world’s leading economies for appliances, lighting and vehicles could boost global GDP by $18 trillion by 2035. Low-carbon innovation can allow developing countries to leapfrog new technologies and expand energy access. In specific industries like shipping and aviation, taking full advantage of already available efficiency measures could save hundreds of billions in fuel costs each year. By seizing opportunities like these, we can expand our economies, make our cities more liveable, and reduce greenhouse gas emissions. However, it’s not always easy for an individual country, business or city to seize these opportunities. International and multi-stakeholder partnerships – between national governments, and among businesses, investors, states and regions, cities and communities – can help, by scaling up technological change, expanding markets, reducing costs, spreading best practices, increasing the flows of finance, and addressing concerns about international competitiveness. Land use partnerships such as REDD+ , the 20x20 Initiative  in Latin America, and the Africa Climate-Smart Agriculture Alliance  should be scaled up, bringing together forest countries, developed economies, and the private sector to halt deforestation and restore degraded land. Multilateral and national development banks should work together with governments and the private sector to reduce the cost of capital for clean energy. Industry associations like the Consumer Goods Forum  can drive innovation and transform markets in key sectors and value chains. Such partnerships can support, enhance and complement the commitments by individual countries and their work collectively to negotiate a new international climate agreement under the UN Framework Convention on Climate Change (UNFCCC) this year. This year is a year of unprecedented opportunity. It is the year that the global community will decide on international sustainable development goals—including how to finance them—and create a new climate agreement. As UN Secretary-General Ban Ki-moon has said, we are the first generation that can eradicate poverty, and the last generation to address climate change before it is too late. The Global Commission’s report shows us the right path forward to achieve a secure, prosperous and sustainable future. Let’s get it right.